These are a sampling of some of my most exciting upcoming performances. You can get more information about attending these events from the embedded links or by contacting me directly. Check out my blog Prone Oboe, where I preview my weekly orchestra concerts. I am really proud of the way my transcription turned out – and now it’s available for purchase! Here’s my favorite ten minutes, in a live performance from April 2018. This spectacular work blends the sounds and styles of East and West and shows off the solo oboe as Athlete and Artist. It is energetic, thrilling, beautiful, wild, intimate, and, eventually, ecstatic. Composed in 1999, this concerto explores the passages of time through a life. By turns nostalgic, sorrowful, and joyously optimistic, it takes musicians and audiences alike on an emotional journey. This delightful piece was commissioned for me in 2006 and I premiered it in 2007 with the New Philharmonic and with the Northwest Indiana Symphony. It’s rhapsodic, virtuosic, and fuuuuuun. This is just a snippet, but you can hear the whole work here. 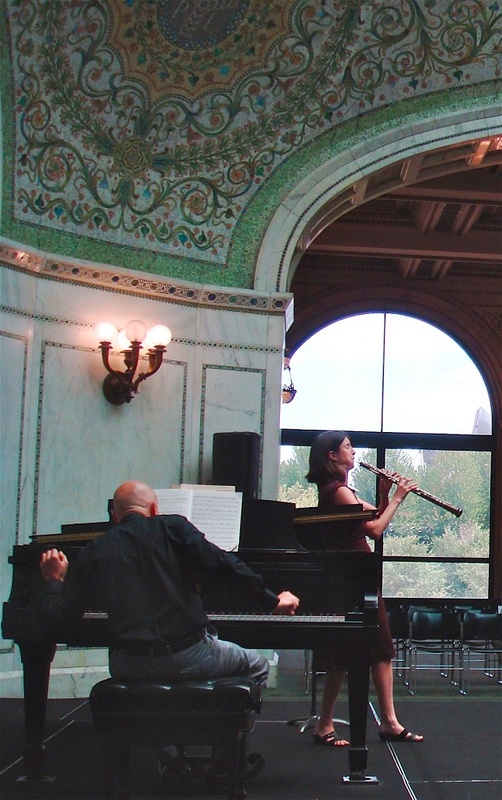 An oboe and flute duo recital featuring female composers. "Music Which SHOULD Have Been Written for the Oboe (Part I)"
This program is one of my all-time favorites. CHROMA is an exploration of color and contrast featuring video elements by Paul Hamilton and Caleb Vinson and music by Rossini, Silvestrini, Pasculli, and Louiguy. It couples the light and movement of Impressionist painting with the beauty and virtuosity of the solo oboe, and celebrated the colors of the human voice. We performed CHROMA three times in 2011, and recently in Philadelphia at the Delaware County Community College’s Concert Series. We are actively looking for new venues for this exciting and virtuosic program. This is a sampling of some of the beautiful visual work created for the performance.